I don’t know what it is about February and snow but this seems to be the time when we get the most and it hangs around. A month ago it was so mild I was transplanting perennials. Maybe that was not the best time, I know, but the plants had been sitting in plastic tubs for almost a year and were getting quite water logged. We’ll see if they survive this. And since I can’t do anything with a garden covered in snow, I played frisbee with my dog instead. 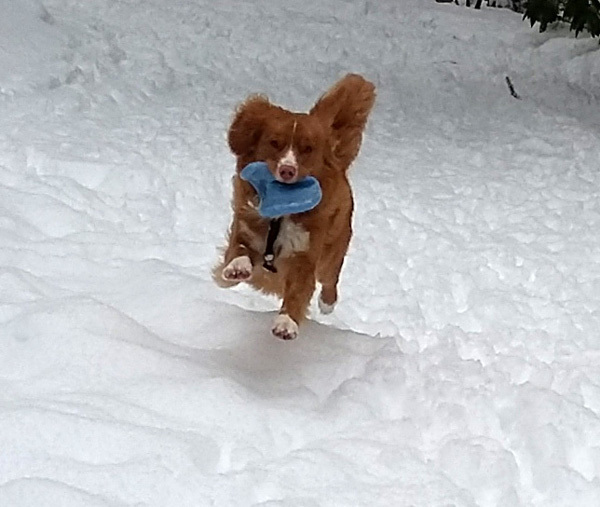 The only thing better than a frisbee in the snow is playing ball in the snow! New raised beds in the kitchen garden. I can’t believe it has been a year-to the day-that I last posted. I did write a blog in the summer but it never made it to my website. It was a busy year and another hot one which meant continuous watering and shading. Growing vegetables on bedrock in a very sunny garden-but no winter sun-is a challenge. For now I will just post a few pictures so I can get back to my gardening books. The calendar just has to nudge into January and my excitement starts building and I think, this will be the year…Ha Ha. No, things will go well and things will go wrong but one thing I am going to do is slow down and make time for just enjoying being in my garden this year. 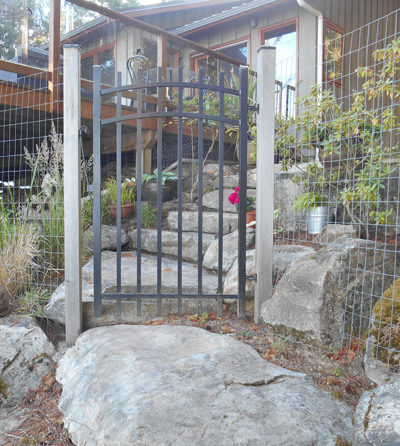 Just a slight modification was necessary to the side entrance walkway. All the beds are constructed of 2 layers of 2 x 8 lumber. 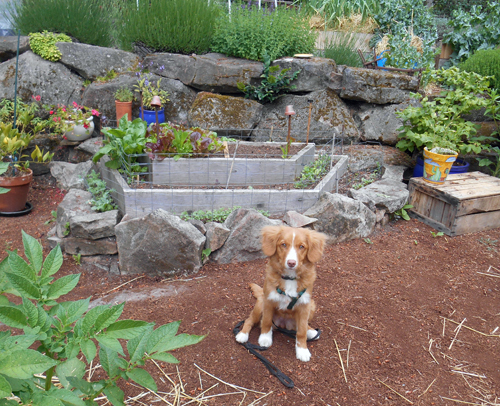 In the past I would always construct the beds 4′ wide but now I tend to 2.5′ to 3.5′ wide as I find I use that space more efficiently and that it is easier to tend to plants like tomatoes and pole beans if they are single file in a bed. And, in order to work around the ‘island’ I have to be flexible. Working around the ‘island’ has its challenges but also adds something to the garden. And I also got a second assistant for the garden this year. She is quite spunky and has no qualms leaping into the beds to see what good stuff there is to eat in them. My little duck toller loves veggies. For several weeks this fall I would pause outside my garden and try to visualize how to change it. A harsh assessment of this past summer’s harvest led to my decision to make some big changes. I was working hard and not seeing results. 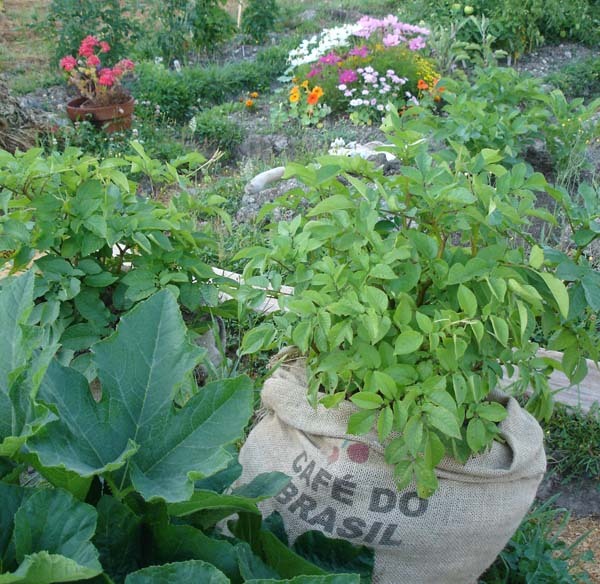 I was tied to my garden as even a weekend camping trip during hot weather resulted in dead or severely dehydrated veggies no matter how much mulch and shade cloth I used. 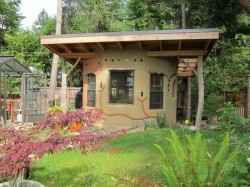 A couple of small changes had already been undertaken in late summer. 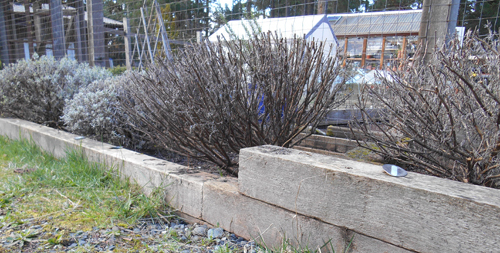 Blueberries, after five years of producing next to nothing, had been moved into large pots. Rhubard, of which I had only one or two cuttings each of the last two years, likewise were moved into a spot with good shoulder sun but less summer sun. We’ll see how these moves work. But the big picture still loomed in front of me. What to do. Any sort of significant change seemed like it would be a lot of work! 1) What didn’t grow well in my garden and possibly why. 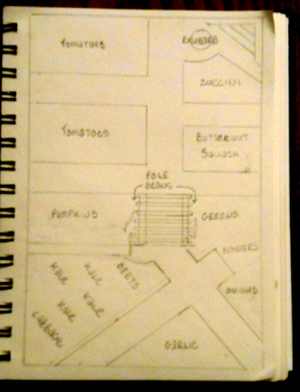 2) What veggies/fruit were most important to me, how much of each did I want and how many square feet of planting space did that require. 3) What layout would accommodate a fully integrated timed irrigation system with the ability to regulate flow individually to the raised beds. 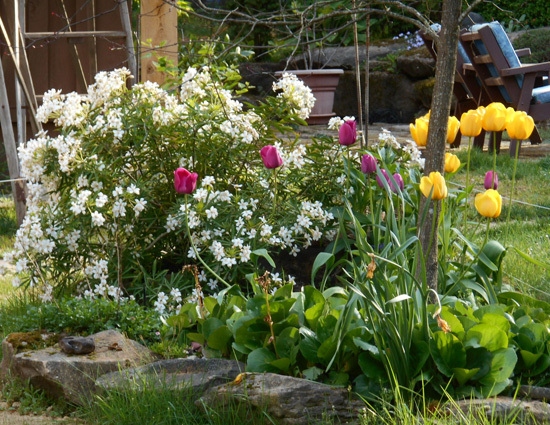 4) The garden must look good. I got through 1 and 2 easily enough but the next two items required knowing the shape of the future potager. Still I hesitated making that first move not sure I was up to committing to the task, but one day I walked into the garden with the dolly and started hauling out the stones from the big stone key bed. 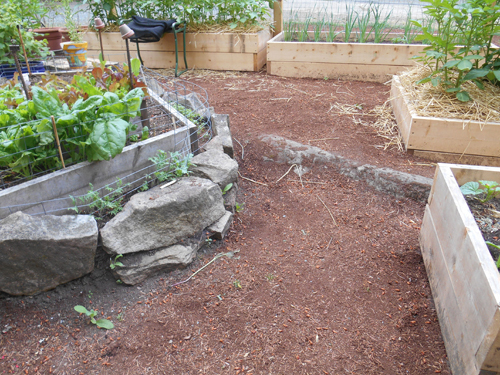 Then with the wheelbarrow, hauled out the soil to a temporary spot outside the garden. And over the course of a couple of months tackled one bed after another. Now the lower level of the garden is more or less cleared. But how to rebuild the raised beds is going to be a challenge given how much the tree roots have invaded many of the beds. 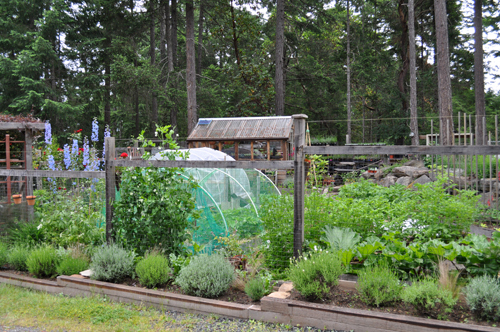 The kitchen garden in late spring a couple of years ago. Lavenders in a bed outside the fence. Kitchen garden today. So sad to see it all gone. The lavenders will shortly be lifted. I tried a few years ago to put in a barrier against the roots, but obviously failed. Reluctantly, I am also removing one side of the garden fencing and will re-fence a slightly smaller space. Tough decision but I need a bit more driveway room. 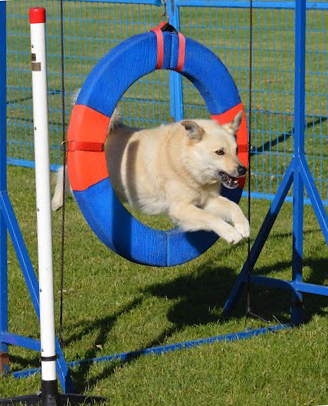 Not for the cars, but for my dog and our agility exercises which usually take place on the driveway. Even though we have almost an acre of property, the land has so many levels with boulders and bedrock protruding everywhere that room to set up agility equipment is at a premium. The garden area is as flat as it gets around my house. I am going to claim some of it. We need a place to train. First I wondered where summer went. Now I am thinking the same of fall. All those months while in the garden I wrote so many blogs, but they never made it out of my head. So what follows is just a few bits of what I remember . Earlier in the summer we were expanding our chicken flock and coop area which involved refurbishing and re-positioning a second coop. Not surprisingly, given our rocky property, there was a bit of stone jutting out of the soil right where I wanted the coop placed. “Let’s just move it”, I said. And again, not surprisingly, it turned out to be an iceberg in disguise. After much effort it was raised up and out of the hole we dug around it. Then we had to deal with that ‘now what?’ question. The boulder had bench potential and we thought a bench about ten feet-uphill of course-from where it was, would be just perfect. So, after yet much more effort, it became a bench. It looks great and isn’t so useful as a bench as a place for any items I am too lazy to put away properly. 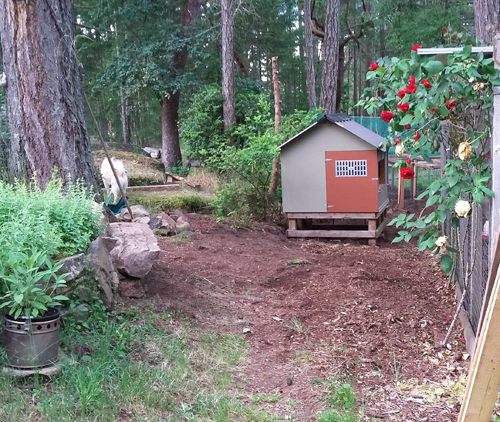 Here’s our refurbished old coop in its new home with the stone bench on the left side. Actually at just the right height to be quite comfy. OK. We didn’t move these boulders into place ourselves, it was thanks to an excavator and skilled operator. 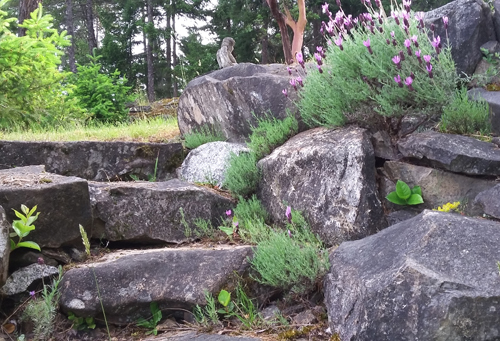 With the over abundance of slabs and boulders on this property we have incorporated stone into much of our landscaping just because we had to do something with it all. Much stone has been given away too. 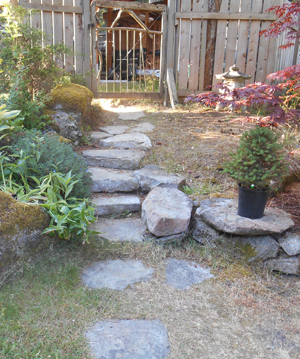 Stone steps to the carport. 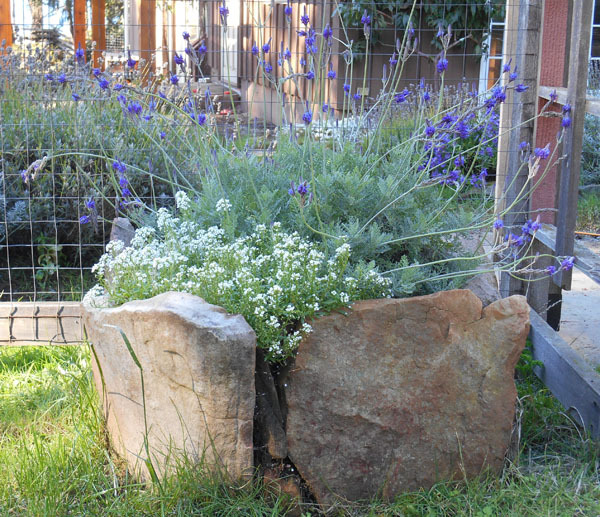 Very rustic stone steps with self-seeding lavender. 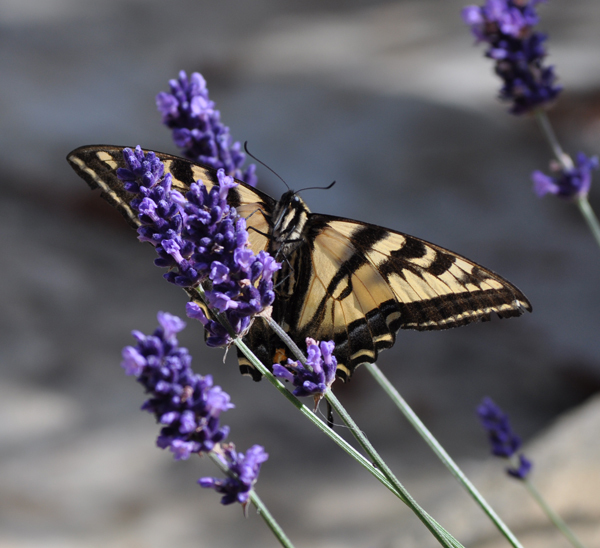 Lavenders were beautiful this past summer. The wet spring followed by a hot summer was perfect. Every year I have a new favourite as though I have discovered a lavender I didn’t have before when, really, for some reason, one or two varieties will be exceptional in any given year. Another thing I notice is how the same variety can have significant variation in its growth not only from year to year but also from one location to another. Even if planted only 50 feet apart. 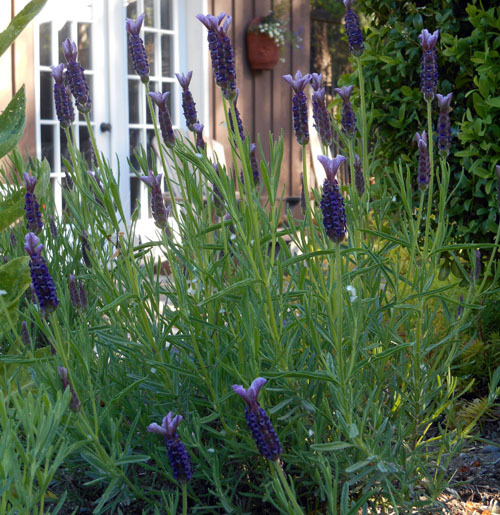 This is what makes it hard for me to recommend varieties sometimes because lavender that do outstanding on my property will not necessarily perform the same on another property. I also got around to harvesting some lavender. I dried Folgate, Royal Velvet, Buena Vista and a little bit of Lodden Blue. These are all L.angustifolias, which is considered the primary culinary variety. 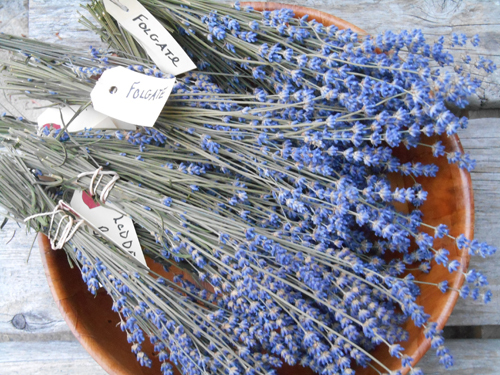 So, if you are buying dried lavender to use in tea or to cook with, find out the variety as the taste may be disappointing if you use a non culinary lavender. This year I was very happy with my plot at the commons: tomatoes were big and plentiful, beans were prolific, garlic was fat and clean and zucchini – well that is not a tough one. In fact, the common’s plot was gorgeous and I took many pictures and then accidentally deleted them all from my phone. So, unfortunately, no pictures. But at home the results were mixed: carrots were great, potatoes decent, cherry tomatoes sweet and abundant but the large tomatoes were small with little fruiting, and the peppers were quite late but decent. Many other veggies struggled, as my garden holds the heat and it was a hot summer. We rely on rainwater collected and stored over the previous winter and, while our supply is finite, I am generous. Still it was not enough, even with heavy mulching. I was disappointed as the last couple of years I have been building up my soil to be more water retentive or so I thought. 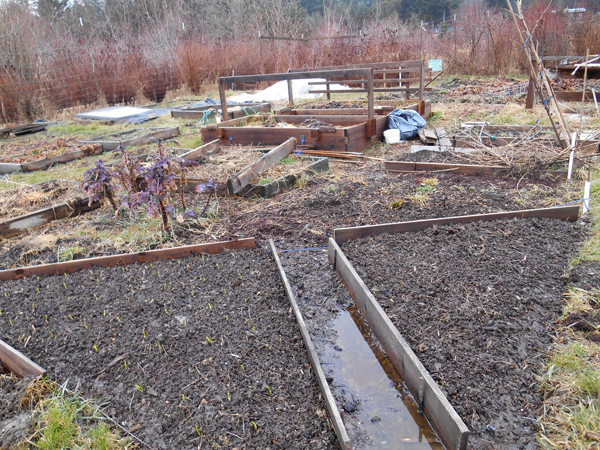 My winter project is to rethink and, possibly, rebuild my potager. L. stoechas ‘Marshwood’, ‘Helmsdale’ & ‘Otto Quast’ blooming. Despite the cold start to the season, the lavenders have begun to bloom. 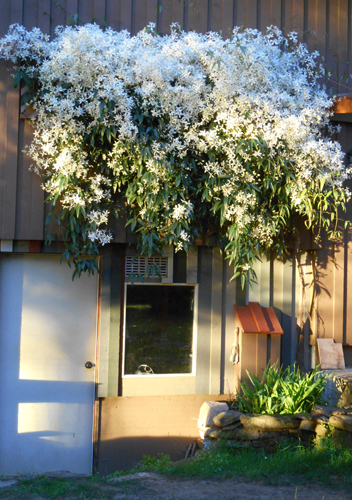 And the L. stoechas are the first to bloom in the Pacific Northwest. They are not particularly hardy but if the soil drains really well, they will get through most of our winters, although this past winter was a bit of a challenge for them. I hold with pruning in the late summer as opposed to waiting until early spring because lavenders are less likely to become misshapen and broken by snow if they have been pruned and shaped a bit. These lavenders have recovered nicely. This lavender is a self seeder. Normally I would pull them up but I’m glad I left this one. One example of numerous dead brugmansias in the greenhouse. It’s mid march and slowly warming up. I am now looking hopefully at my plants for signs of growth but instead I am seeing what looks like a fair number of dead plants. First off, in the greenhouse, which is heated during cold spells, it looks like all of my brugmansias have died. A couple of these plants I have had for more than 10 years. 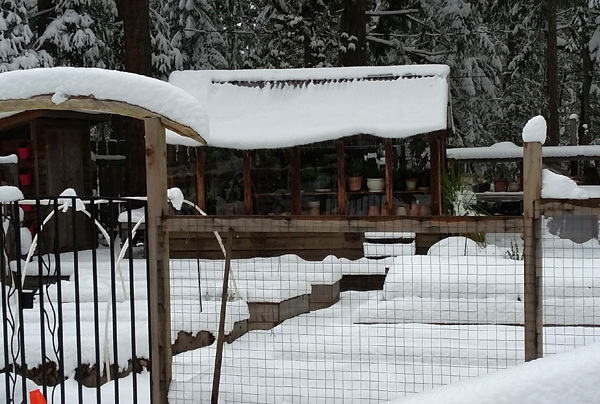 and it’s not like this is the first cold winter we’ve had, but it requires a fine balance to heat a small greenhouse in the winter. Too much heat and there are more mildew problems or weak growth, too little and plants die. The brugmansia-about eight of them-look dead to me, but I won’t write them off yet. In the garden several lavenders look a little unhappy as well. Actually dead. 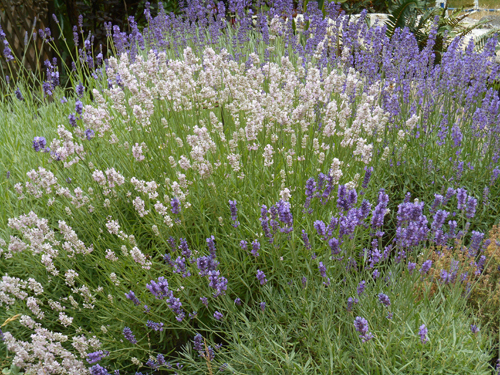 But I know lavenders can look almost dead and then I am amazed how they leaf up and bush out. Looking at these ‘dead’ plants there doesn’t seem to be logic to what may have died. In the front of our property, where the growing conditions are quite harsh because of the wind and lack of soil, the lavenders look ok. I don’t actually hold out any hope for the two lavenders on the right. They never grow very lush on that part of the property but they have definitely survived this winter. 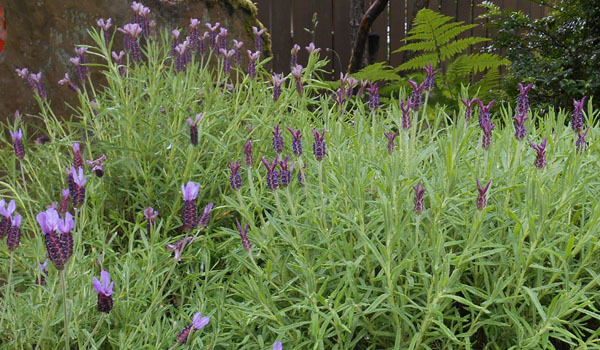 In a bed of five lavenders, under the sheltering branches of a fir tree, four of the lavenders look the healthiest of all the lavenders on my property whereas the fifth looks dead. And the dead one is the lavender I would have pegged as the hardiest of the five. Likewise, here and there, more lavenders look dead but I will wait before pulling them up. In a normal winter, maybe one will die but often not. 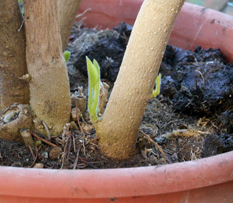 Brugmsansia showing signs of life after all. pulled up a whole bed of strawberry plants that looked like they had root rot although they were planted in a tiered bed and in what I would have considered well draining soil. Sigh. Note: this blog did not get posted when I wrote it, so now, three weeks later, I am so happy to see signs of life on two of my brugmansias. They definately won’t bloom as they did in previous years but at least I can take some cuttings and look forward to healthy, robust plants in a couple of years. And some plants have not only survived but are putting out their best. 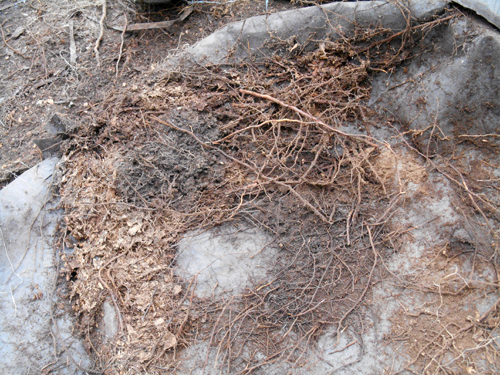 This armandi clamatis is not particularly hardy but the foliage and roots are sheltered by the eaves on the studio roof. A stunning show as usual. 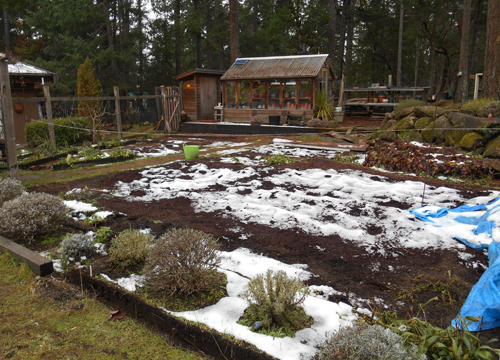 After a cold start to march–more snow–it looks like we can finally get our hands into the soil. 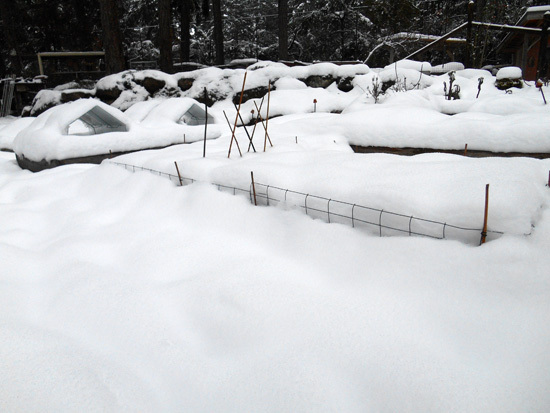 I had already got out in February and planted some onion sets in my home garden but my garden at the commons was still covered then in snow. So last weekend, being dryish, I was able to plant onion sets down there. I was glad I had managed to prepare the onion bed when I was planting garlic in the fall as the heavy rainfall before winter set in, prevented me from getting back down there to clean up and the soil right now is way too wet to work. I am embarrassed to show you the plot but here it is. My plot is dry compared to many others but still way to wet to work in. The plots in this section of the commons are about 200 square feet so not large, but still large enough to haul out an amazing amount of produce. I plant the bulk of my tomatoes for canning here and mostly veggies that can handle a bit of neglect. The plot is very close to my home and it’s easy to run up and harvest items when wanted. Looking at the plot on the weekend I wondered how I would plant it this year. 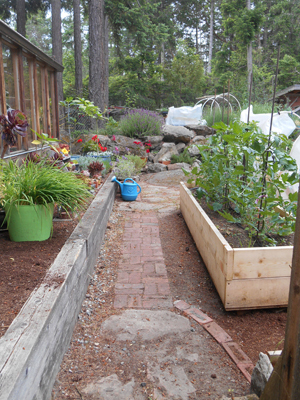 I really like changing a garden around which is a bit difficult to do when you have permanent raised beds. At home I satisfy this need for change by moving perennial plants around ie. in the fall I moved a dwarf apple tree from the back of the garden to the front. I plant herbs in the borders, then I move them all out a couple of years later. Flowers in, then flowers out. 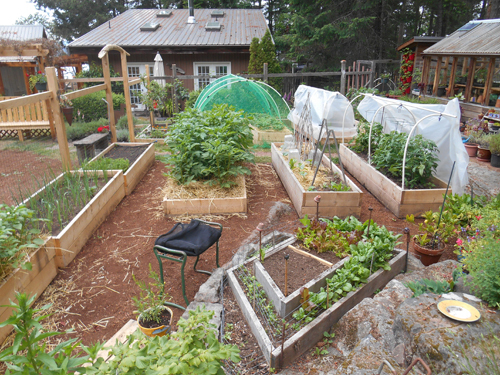 I double up raised beds and then I might tier a couple. 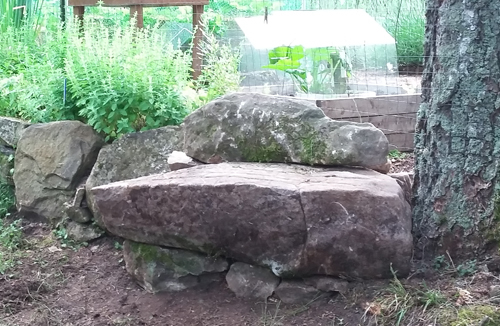 I take out some wood beds and replace them with stones. And I use pots. So, it’s subtle, but it’s always changing a bit. The commons garden isn’t big enough for real design but it is still possible to have a bit of fun with it.In the fall I decided that I would remove half of my permanent beds but, before I could finish, the rains set in and put an end to my efforts. What I will do now is just use boards and rebar and fashion the beds as I need them. It’s a bit more work but not big space. So here is my plan for this year. Maybe not so much a plan as a guide. My gardens always have a main path that allows for a wheelbarrow and then the feeder paths might be narrower but not so narrow that I have to balance on one foot and a hand while trying to weed. And finally, back to my home garden where I have been able to move a few things from the sometimes heated greenhouse to the totally unheated greenhouse which means I can utilize my propagating stand for its intended purpose. Flats with peppers, more onions, leeks, and then tomatoes have all been seeded. In the garden, buds are starting to swell on the dwarf fruit trees, rhubarb is poking above the soil and the strawberries plants are looking a little denuded without their dead leaves but perky after their cleanup. Now we move forward into my favourite time of the year. On feb 1st I started writing a blog about how excited I get when the calendar turns to february; the month I think of as the return to two digit temperatures and noticeably longer days. But it was cold. A couple of days later it snowed, and it snowed the next day and a couple of days after that still more snow. Then it just was plain freezing for another week. My garden lay buried for a good two weeks. In feb! We got a reprieve for a few days when the rains moved in and finally washed away the snow but not until the snow absorbed tons of moisture and and broke limbs on trees and splayed shrubs. Then I think ok, that’s it, and it was nice for a couple of days, but it got cold again. Today it snowed. And it’s cold tonight and will continue cold. It’s been cold for three months and I am not used to this much cold in a winter. The nights, yes, but the days, especially at this time of year, usually get pleasant, but it’s painful trying to work outside most days. (What a whiny west coaster, eh?). – planted some onion seeds and put them on a heat mat in the greenhouse. That’s it. Not very impressive compared to my usual feb but at least some chores got scratched off the list. In a few days it is march, and in a few weeks, the equinox. I am so looking forward to some warmth and some colour. Bulbs underneath the Pansy tree. Lately I’ve been looking at my garden and thinking how small it is. Even while acknowledging that this is an affliction that hits me every now and then, especially in the winter and early spring, I walk around looking for expansion space on my property. But then I will be reminded of how hard I work to process all the produce and herbs that do come from my existing garden. Like tonight we had our evening plans cancelled-which included supper out-because of the snow, so we quickly settled on a pasta meal. That meant into the pantry to pull a jar of tomato sauce from the shelf along with an onion and a garlic from last summer’s garden. Then from the spice drawer, dehydrated oregano and parsley also from the garden. Allowed to simmer for a bit, it became a great sauce with that still fresh tomato flavour and I thought of the 200 pounds of tomatoes I had skinned, cut, drained, simmered for an hour or so then froze or canned. That was a lot of work. And that was just the tomatoes. More space would mean I would plant more. But what I have keeps me very busy. It is enough garden. 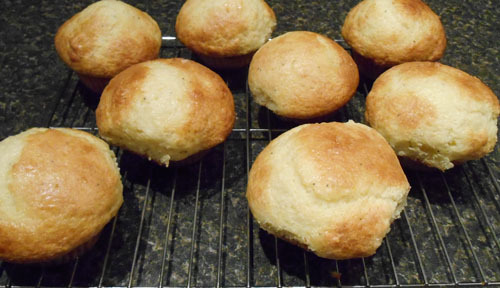 After supper I set about making some muffins for the next day. I really wanted bran muffins but we were out of honey, so I thought of the poppy seed I had finally got around to sifting earlier in the day. I also knew that one of my lemon bushes had some beautiful lemons on it. So it was going to be lemon and poppy seed muffins. 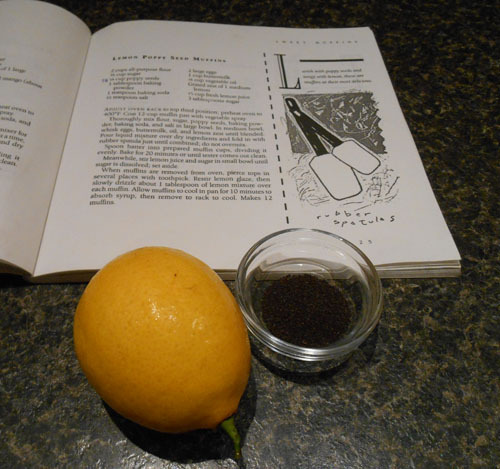 I grabbed the flashlight and set out in the snow for the greenhouse and returned to the kitchen with a plump lemon. An hour later I had a rack of delicious smelling muffins. I’m glad november is done as it’s a hard month for me, especially when the rain never seems to end. The studio helps me get through the first of the three dark months. Even on the dullest day, I can easily spend hours working with glass, pulling pieces from my bins, cutting and fitting and be completely oblivious to what’s going on outside my studio window. Now it’s december and I will continue to work in my studio but already I am feeling more up as the big day in December creeps closer–which for me is the 21st. And a few days ago, something else happened that cheered me up. I got Potagerway back from the hackers. I won’t go into details except that I did not expect to see it again but thanks to the generous efforts of someone, my website was restored. To scroll through the web postings and pictures of the garden makes me excited to start planning for 2017. So not much is happening in the garden right now but once again I will post a picture of Lavendula multifidia which thrives in the PNW fall. This picture was taken a month ago but the lavender was still going strong when I dug it up two days ago, as we are expecting a cold spell. Although it is a tender plant, it handles being dug up, potted up and placed in the cool greenhouse for the winter. 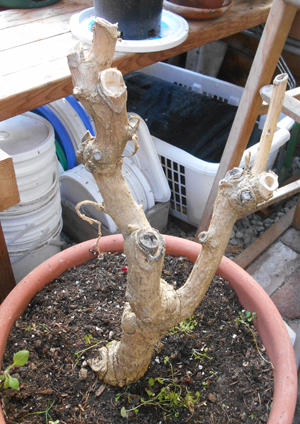 After the last spring frost, a light prune and then back into the ground. Lavendula multifidia does not have a pleasant scent and some may think it’s a bit unruly-although I like that-but the flowers are a bright blue and an interesting shape, and are plentiful. This really is a good book for DIY beginners! Good design information. Great pictures. Showcases a handful of formal & informal gardens. Also delves into design considerations. 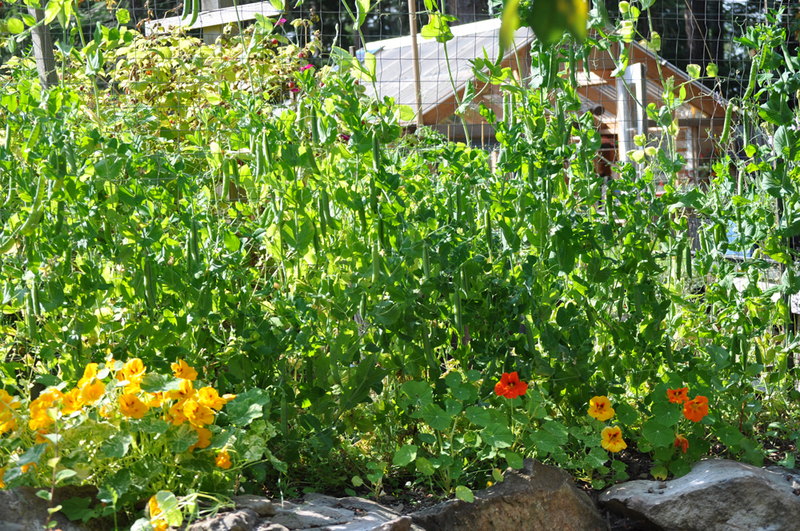 How about a kitchen garden on your balcony or roof top? Lots of ideas and good pictures.